The Tokyo Gas Group strives to create a recycling-based society by implementing its Guidelines for Promoting Resource Saving and Recycling and rigorously practicing the 3Rs of reduction, reuse and recycling of waste across the Group. Specifically, we seek to achieve zero waste emissions at production sites, reduce the amount of soil excavated during gas pipeline construction, reuse old gas meters and recycle used gas pipes at every stage of our business activities. Group offices produce various types of industrial waste, such as plastics from containers and packaging and waste from technological development and training as well as maintenance work at customer sites. 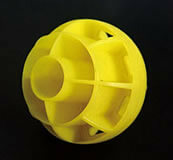 The Group is strongly committed to waste separation and strives to recycle and properly handle waste. We promote efforts at offices to reduce the use of copy paper, generate less paper waste and recycle used paper. *1 Production plants includes data at facilities that make products, including city gas, and district heating and cooling centers as well as power plants. Construction Work includes data on construction work won by Group companies, while Offices, etc. includes data on other undertakings. *2 Includes construction work at the sites of Group company customers. Gas pipeline installation work produces excavated soil and asphalt concrete lumps. We lay pipes shallowly in narrow trenches and use the non-open-cut construction method to reduce the volume of excavated soil, re-bury excavated soil and make more use of improved soil and recycled road surface materials under our 3R efforts. When we re-excavate the same location, we use newly developed materials and construction methods, such as Eco-balls, an innovative temporary backfill. Reducing excavated soil leads to less use of mountain sand and lower CO2 emissions from transport vehicles. We take steps to reduce waste toward achieving zero emissions (a final disposal rate of less than 0.1%) at LNG terminals, which include city gas production plants, power plants and district heating and cooling centers. In fiscal 2017, we produced 617 tons of industrial and other waste, and 4 tons were subjected to final disposal for a final disposal rate of 0.6%*. 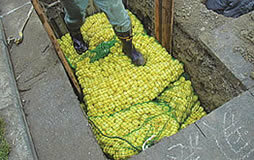 *Calculation excludes hard-to-recycle industrial waste such as asbestos. Tokyo Gas began reusing gas meters immediately after their initial introduction, ahead of other gas service companies and companies in other industries. Although gas meters installed at customer sites are typically replaced before the expiration of their 10-year certified life, we collect retired gas meters, replace consumable parts, recalibrate them and reuse them for up to three cycles, or 30 years. In fiscal 2017, we reused 392 thousand gas meters, thereby avoiding the generation of 1,632 tons of potential waste. Gas meters reused for three cycles have been recycled through our own channel and reused by electric furnace makers and other companies as material for new products. 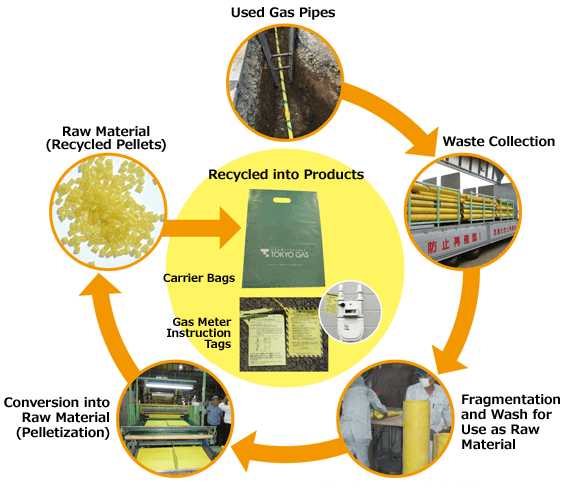 In fiscal 1994, we established a system for recycling used gas pipes, which are removed during gas pipeline installation work and achieved an annual recycling rate of 100%. Polyethylene (PE) pipes* are reprocessed into such items as gas meter tags that show how to restart them after shut-off in the event of an emergency. Steel and cast-iron pipes are 100% recycled into raw materials by electric furnace makers and other companies. *PE pipes have been in widespread use since the Great Hanshin-Awaji Earthquake in 1995 because of their earthquake resistance and anticorrosive property. We follow our Guidelines for Promoting Resource Saving and Recycling and strive to reduce the use of copy paper at all workplaces by holding paperless meetings and promoting double-sided printing. Moreover, we recommend using Forest Stewardship Council (FSC)-certified paper made from sources with proven consideration for the environment, such as forest conservation and support for the sustainable use of forests. 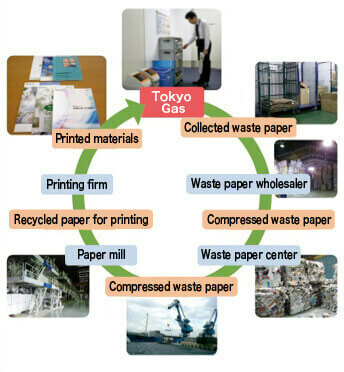 In fiscal 2003, we started collecting used documents and waste paper and purchased and used recycled paper as Tokyo Gas Recycled Paper. In fiscal 2017, we purchased 247 tons of paper recycled in this way and used it for CSR reports, marketing pamphlets and other publications. Unlike the ordinary recycling of waste paper or purchases of recycled paper, we provide materials for Tokyo Gas Recycled Paper and purchase the paper as an independent effort to green the paper-related product chain. Furthermore, we have received cooperation from a wide range of companies, from waste paper haulers and waste paper wholesalers to paper wholesalers and paper manufacturers, in terms of the waste paper distribution and recycled paper production stages, and also from production and printing companies at the printing stage. Internally as well, all of our employees carefully separate waste to make it possible for us to provide high-quality waste paper for recycling. We promote the 3Rs at customer sites by controlling waste generation through considerations at the design stage, reducing container and packaging waste, and collecting used appliances. We have operated our own Saving & Recycling Innovative Model System (SRIMS) since August 1994 to collect waste when we deliver gas appliances, parts and piping materials to partner companies. Through this system, which allows us to reduce environmental impact while also cutting costs, we collect used gas appliances and waste that comes from replacement by customers and gas installation or home renovation work. In fiscal 2017, we collected 8,140 tons of waste and recycled 7,693 tons. The so-called A Group led by Panasonic Corporation and Toshiba Corporation collects and recycles Tokyo Gas-brand household gas air conditioners and clothes dryers. These are eligible for recycling under the Act on Recycling of Specified Kinds of Home Appliances (Home Appliance Recycling Law). In fiscal 2017, 90% (compared to at least 80% legally mandated) of our air conditioners collected and 87% (82% legally mandated) of our clothes dryers collected were recycled in terms of gross weight. We make it a rule to collect discarded containers and packaging when partner companies sell and install gas appliances to reduce waste at customer sites. 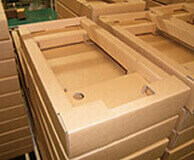 Collected containers and packaging are recycled in the Saving & Recycling Innovative Model System (SRIMS). In fiscal 2017, approximately 575 tons of corrugated cardboard and 15 tons of polystyrene foam were recycled. 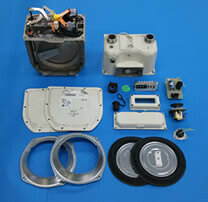 In addition, we work to reduce the quantity of containers and packaging for gas appliances. These efforts include reducing cushioning through the redesigning of cardboard packaging, cutting back on the use of cardboard through shrink wrapping in plastic film, and adopting returnable packaging, in which packaging materials are collected and reused. The Group deals with waste from gas equipment installation work under direct contracts with gas utilities, gas pipe work at customer sites, installation of air-conditioning, heating and hot water systems, and home renovation work. This waste is mainly construction rubble and sludge, scrap metal and woodchips. We have adopted the prefabrication and precut method for piping work for the Tokyo Gas Eco-System (TES) used at condominiums. Pipes and joints as well as other materials are processed at manufacturing plants and supplied as piping sets in time for the work at each house. The only work necessary at the worksite is connecting and fixing the pipes to appliances. Since advance processing reduces waste, we promote this method in cooperation with manufacturers and installation contractors. Replacement of equipment or pipes at condominiums using our HEATS gas central air-conditioning and heating system requires dismantling and removal work. At a relatively small scale, this often used to require the disposal of mixed waste because the work period and space did not allow waste separation. We have therefore established out a waste separation protocol at the planning stage of construction work in coordination with relevant parties. Thanks to measures such as worker training in waste separation, we have achieved zero mixed waste from construction work and reduced the volume of landfill waste disposal.